When the original Olympus Pen F 35mm half-frame SLR was introduced in 1963 it was the only half-frame SLR and the smallest full system SLR in the world. It was a uniquely styled camera with a smooth, sleek, minimalist design made possible by the use of a system of mirrors instead of a conventional pentaprism, hence no characteristic SLR bump on top. This system of mirrors included an unusual primary mirror that moved vertically out of the light path when the shutter was released. In my opinion the Pen F series is one of the most beautiful cameras ever designed. It is a very high quality device with very smooth operation. The Olympus Pen FT replaced the Pen F in 1966. It introduced a number of minor improvements (i.e. a single stroke film advance instead of double stroke, a self timer and a focusing screen with a micro prism) and one major advance in the form of open-aperture TTL (through the lens) exposure metering. This was at a time such things were still something of a novelty. The metering system utilised a semi-silvered mirror that directed some light to the metering cell, and the rest to the view-finder. This resulted in a view finder that was unfortunately somewhat dimmer than the original Pen F.
The viewfinder of the Pen FT has a series of numbers from 0 to 7 in the view finder with a needle to indicate a number. This number must then be set on the lens. There is no coupling to either the lens or the shutter speed: you must take your eye away from the viewfinder to transfer the number observed in the viewfinder to the lens. Overall the system is rather cumbersome, but at the time I think TTL metering was enough of a surprising novelty for people to forgive this! Lenses made after the introduction of the Pen FT have an aperture ring with light meter numbers on one side and F numbers on the other. The aperture ring can be turned all the way around so either the light meter numbers or F stops are on top of the lens. This system was claimed to be easier to understand then obscure F stop numbers, which tend to confuse beginners. But to be honest it is a rather slow and cumbersome to use in practice! The Pen FV was introduced shortly after the Pen FT. It included all the improvements of the Pen FT, but without the TTL metering and it therefore had the brighter view finder of the original Pen F. The Pen FV is considerably rarer than the Pen F or Pen FT and often commands higher prices, though the rare black version of the Pen FT is the most sought after, and most valuable, model of all. Apart from being the first half-frame SLR (yielding 72 exposures on a 36 exposure film), the Pen F series had a number of other innovations, including an unusual rotating focal plane shutter that permitted flash synchronisation at all shutter speeds. This is a feature that remains unique among focal plane shutter cameras to this day. The Pen F camera was part of a comprehensive system. There was a range of lenses from 20mm to 800mm, including ultra fast lenses with apertures as fast as f/1.2, macro lenses, mirror lenses and some early examples of zoom lenses. Note that there is an approximate conversion factor of 1.4x to give 35mm equivalents focal lengths. The only thing lacking in the Pen F lens range was an ultra wide-angle lens, the widest being a 20mm lens giving a field of view similar to a 28mm lens on a full frame 35mm camera. There were also accessories such as an external meter for the Pen F/FV, bellows units, extension tubes and reversing adapters for close focus (and, indeed, extreme close focus) photography, and flash units. Olympus used some very clever marketing for the Pen F range which naturally focussed on the very small size of the Pen F system. 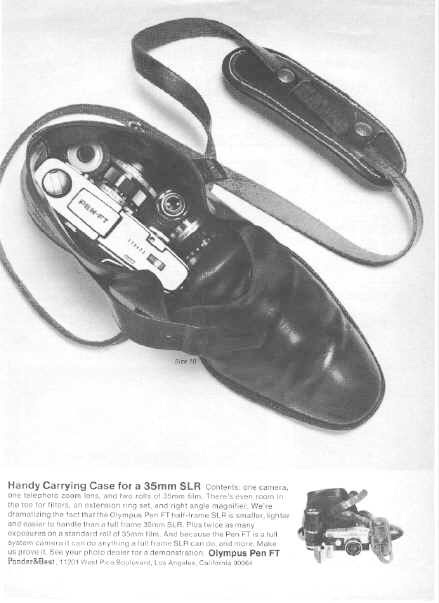 There was even an advert featuring a shoe being used as a camera bag! Porroprism finder, magnification 0.8x (standard lens), with Fresnel lens. Double action with 90 degree self-cocking lever. Double exposure impossible. Hinge system with release built into rewind knob. Porroprism finder, magnification 0.8x (standard lens), with microprism and special Fresnel lens. I bought this camera mainly for the lens it came with, the rather rare 38mm f/2.8 pancake. But it is also nice to have the original Pen F camera in my collection with it’s lovely gothic letter F on the front. This camera, pictured here with the 40mm f/1.4 lens that it came with, has been in my collection for a long time. There have been times in the past when I have sold almost my entire collection, but this is one camera I have never been able to part with! I suppose sooner or later I'd have to add the final Pen F camera, the Pen FV, to my collection! My Pen FV came with one of the original (i.e. non-pancake) version of the 38mm f/2.8 lens. This is the widest angle lens in the Olympus Pen F range. When used on a Pen F film camera the field of view is similar to a 28mm lens on a full frame 35mm camera. When used on a digital camera with the an APS-C sensor the full frame equivalent field of view is 30mm, and it’s 40mm on a M/43 camera. Along with the 100mm f/3.5, this is the most common lens in the Pen F range. When used on a Pen F film camera the field of view is similar to a 35mm lens on a full frame 35mm camera. When used on a digital camera with an APS-C sensor the full frame equivalent field of view is 37.5mm, and it’s 50mm on a M/43 camera. The 25mm f/4 and 100mm f3.5, along with one of the standard lenses would have been a very common outfit. Unfortunately my example of the 25mm f/4 has a dysfunctional aperture diaphragm, which is why I purchased the f/2.8 version (see below) to replace it. But that doesn’t necessarily stop me from mounting it on a digital camera, it just means I’m limited to using it permanently at it’s maximum aperture. The f2.8 version of the 25mm was a much higher quality lens than the f/4 version. It is also a much larger and heavier lens. This is quite a rare lens. My example is in rather rough condition, but the mechanics and optics are in very good condition, and since I bought this lens mainly as a user, that is the most important thing. When used on a digital camera this lens is certainly capable of very fine results. This is one of the less known of the Olympus Pen F lenses. Most Pen F collectors have heard of the amazingly tiny 38mm f/2.8 pancake lens, but this is the original 38mm f/2..8 lens, a simple 4 element lens intended as a budget option for those who wanted to get in to the Pen F system at the lowest possible entry point. It was only produced quite early in the life of the Pen F series, so it's actually quite rare, but because it is one of the less technically interesting of the Pen F lenses it isn't in high demand, despite it's rarity. My copy came with my Pen FV. I haven't yet taken any photos with this lens. This is by far and away the smallest lens in the Pen F range. It turns the Pen F cameras into truly pocketable 35mm SLR cameras, and there aren’t many cameras that can claim that! As with most ‘pancake’ type lenses ergonomics take a back seat to small size… with no room for a proper focusing ring you have to feel for the two focusing tabs on each side of the lens. When used on a Pen F film camera the field of view is similar to a 55mm lens on a full frame 35mm camera. When used on a digital camera with the an APS-C sensor the full frame equivalent field of view is 57mm, and it’s 76mm on a M/43 camera. Using this lens on a digital camera is certainly fun, but it seems with this lens image quality also takes a back seat to small size! With extremely soft corners the result certainly have character, which I actually quite like, but this lens certainly isn’t one to choose when you’re looking for high resolution! Olympus had quite an extensive range of close-up equipment in the Pen F system, including a bellows unit and this macro lens. Below left you can see this lens racked out to it’s closest focus setting. It is a tiny and very convenient lens that was really quite ground breaking at the time it was launched. It is one of the rarer Pen F lenses. With it’s 38mm focal length this lens give a field of view similar to a 55mm lens on a full frame 35mm camera. When used on a Pen F film camera the field of view is similar to a 55mm lens on a full frame 35mm camera. When used on a digital camera with the an APS-C sensor the full frame equivalent field of view is 57mm, and it’s 76mm on a M/43 camera. Below is a test shot of a stamp using my Olympus E-PL3 camera. The sensor on this camera is 13mm wide, and a UK stamp is 15mm wide, so as you can see this lens is getting very close to a 1:1 reproduction ration! This is one of a wide range of standard lenses Olympus made for the Pen F system, there where 5 in total: a 38mm f/2.8 pancake (see above), a 38mm f/2.8 normal model (only produced for a short time very early on in Pen F range), the 38mm f1.8 (the most common, and, some would say, the sharpest), the 40mm f/1.4 you see here, and finally the rare and desirable (though apparently not very sharp!) 42mm f/1.2, which is the fastest lens in the whole Pen F range. I really love this lens and I have taken many photographs with it on various digital cameras. When used on a Pen F film camera the field of view is similar to a 58mm lens on a full frame 35mm camera. When used on a digital camera with the an APS-C sensor the full frame equivalent field of view is 60mm, and it’s 80mm on a M/43 camera. It gives a very distinctive quality to the out-of-focus areas of a shot (otherwise know as ‘bokeh’) that is quite unlike a modern lens. This is the fastest telephoto lens in the Pen F range. When used on a Pen F film camera the field of view is similar to a 85mm lens on a full frame 35mm camera. When used on a digital camera with the an APS-C sensor the full frame equivalent field of view is 90mm, and it’s 120mm on a M/43 camera. This is another recent acquisition. When I first tried this lens I wasn’t too sure about the bokeh, but that was with subjects in the middle distance (3-5 meters). with subjects in the close range (1-2 meters) I like the bokeh much better. Typical of most fast Pen F glass this is a real double personality lens: wide open you get a real vintage look with very distinctive bokeh, and stopped down you get a much more modern look. Along with the 25mm f/4, this is pretty much the most common Olympus Pen F lens. With a 35mm equivalent focal length of 143mm this was the Pen F version of the typical 135mm lens on full frame 35mm cameras, offering a smidgen extra reach and a much smaller size. It is quite a sharp little lens and it works very well on cameras with APS-C sized sensors. By the standards of the time, this was the first lens in the Olympus Pen F range that just nudged into super-telephoto range… it was also the longest lens in the Pen F range to retain a fully automatic aperture diaphragm. When used on a Pen F film camera the field of view is similar to a 210mm lens on a full frame 35mm camera. When used on a digital camera with the an APS-C sensor the full frame equivalent field of view is 225mm, and it’s 300mm on a M/43 camera. I haven’t used this lens much on a digital camera so I don’t have any sample photos. Olympus made just 2 zoom lenses for the Pen F system. One was a 100-200mm f/5 lens with a preset aperture diaphragm. But the first was this lens, a 50-90mm zoom. The zoom ratio was, by modern standards, a very modest 1.8x, but zoom lenses where still quite a novelty at the time, so I suppose people were willing to except this in exchange for the thrill of using a zoom lens perhaps for the first time! Judging by the fact that even today this is a pretty common lens I can only assume that despite the limited zoom range, and the rather bulky dimensions, this was a popular lens that sold in quite large numbers. When used on a Pen F film camera the field of view is similar to a 70-130mm lens on a full frame 35mm camera. When used on a digital camera with the an APS-C sensor the full frame equivalent field of view is 75-135mm, and it’s 100-180mm on a M/43 camera. My example is in rather rough condition, and it’s an early model with an aperture ring that lacks the Pen FT’s metering numbers. As far as I am aware a tele-converter was one accessory that Olympus never made for the Pen F system, but when a company leaves such a gap in a popular system you can rely on the third party manufacturers to step in and fill it! This tiny little converter multiples the focal length by 2x and reduces aperture by 2 stops. It maintains the automatic diaphragm of the lens it is used with. I’ve showed this tele-converter attached to the 150mm lens to give a 300mm f8 lens. Rather a slow combination, but it may have still be useful in a pinch! One of the great things about modern compact system cameras (CSCs… also known as mirrorless cameras) is the ease with which they can be adapted to use classic lenses from bygone eras. This is because the distance between the sensor and the front of the lens mount (the so called flange-back distance) is much less than most film cameras designed for 35mm film. This in turn means that the depth of the adapter doesn’t prevent the lens from focusing to infinity. The manufacturers of many CSCs often make adapters themselves (for example, Fujifilm make an adapter to fit Leica M mount lenses on their cameras). But because a basic adapter is so easy to make, a host of small far east companies make adapters for practically every other mount you can imagine. They then sell them on Amazon and eBay for very little money, generally in the £15-25 range. The crop factor for M4/3 cameras, such as those made by Olympus and Panasonic is 2x, so you are using Pen F lenses somewhat outside of their original scope, but the difference is still much smaller then when you mount 35mm full frame lenses on a M4/3 camera. I find that on my Fujifilm X-E1 camera (35mm equiv. focal lengths in brackets) my 20mm f/3.5 (30mm), 25mm f/2.8 (37mm, not show in the above X-E1 photo), 38mm f/3.5 macro (59mm), 40mm f/1.4 (60mm), 60mm f/1.5 (90mm) and 100mm f3.5 (150mm) make most sense. Together these lenses cover a really useful range of focal lengths. On my Olympus Digital Pen M4/3 cameras the wide angle lenses make less sense, as they just become rather slow standard lenses, but the 38mm f3.5 macro (76mm), 40mm f/1.4 (80mm) and 60mm f/1.5 (120mm) make wonderful macro and fast short telephoto lenses. One of my recent acquisitions I am most excited by is the Pen F 38mm macro. This tiny lens weighs just 230 grams including the mount adapter, and gives superb results on both APS-C and M4/3 cameras. And since I don’t already have a macro lens for my M4/3 cameras I think this lens is definitely going to save me a purchase! And giving these beautiful example of 1960s engineering another burst of life is a real pleasure.